A minor crop in New York, rutabaga can sometimes be found in farmers markets or retail stands. It is harvested from August through November. 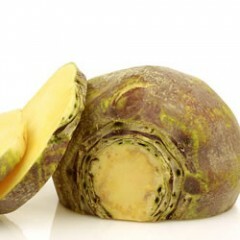 Rutabaga is thought to have originated from a cross between a turnip and cabbage. All cruciferous crops share a common set of diseases and insects. Rutabaga is grown in much the same way as turnips. Commercial vegetable growers will find a Cold Storage Chart by crop type with temperature and relative humidity recommendations. The maximum number of weeks that the crop can be held under ideal conditions is provided as well. Adapted from the USDA Bulletin #66, The Commercial Storage of Fruits, Vegetables, and Florist and Nursery Stock, growers will find information on quality, grading, sizes, and packaging, chilling and storage, and post-harvest pathology of vegetables.